The Gold Standard of Texas Home Inspections. Lone Star ASHI members are inspectors dedicated to their profession. All home Inspectors in Texas are licensed by the Texas Real Estate Commission. However, membership in ASHI requires higher Standards of Practice on each and every inspection that they perform, and very few Texas home inspectors meet ASHI’s standards. This higher standard translates into a more thorough inspection and additional information provided to you, the client. Our membership has over a million inspections worth of experience which we share amongst ourselves. Lone Star ASHI members will welcome any questions that you may have regarding their services and can be located by searching the Find A Home Inspector section of this website. Lone Star ASHI Mission Statement. Lone Star ASHI, the Texas Chapter of the American Society of Home Inspectors, is a non-profit organization working for consistency and quality in home inspection services on national and Texas levels. The Lone Star ASHI Chapter was also formed to provide the networking, support and advertising necessary to help Texas ASHI Home Inspectors perform at that level of service. Members of the Lone Star ASHI Chapter participate in local, state and national Home Inspection legislation and regulation issues. The American Society of Home Inspectors (ASHI). ASHI recognizes the necessity of supervision and involvement in home inspection issues to best represent the home inspector and their clients. ASHI is the organization that speaks for the national home inspection industry. 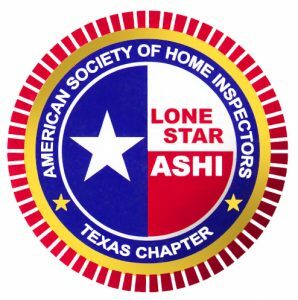 The Lone Star ASHI Chapter exists to provide an avenue for the Texas home inspector to have a voice in any discussion that may take place regarding our industry on a national or local level, and to help Texas inspectors meet the high standards required by the American Society of Home Inspectors.